“Complicated Process”: Of Joint Russian-Turkish Patrols Still Not Launched 4.6666666666667 out of 5 based on 3 ratings. 3 user reviews. The Idlib de-escalation agreement continues to shrink under pressure from an increasing number of ceasefire violations by militant groups operating in the area. Earlier, Russia and Turkey reached an agreement to launch patrols in the de-miltiarized zone to put an end to these violations, but this has not been done yet. A new agreement between Russia and Turkey on the situation in the Syrian province of Idlib comes in continuation of the bilateral memorandum signed in September 2018, Russian Deputy Foreign Minsiter Sergei Vershinin said on March 14. The diplomat said that Russian and Turkish forces will patrol the demilitarized area. “In other words, there will be unilateral patrols by, say, the Turkish side, followed by Russian patrols, and then by joint patrols. Those patrols have already begun and they will continue,” he revealed adding that this is a very “complicated process”. “At the moment, it would be correct to say that many thousands of militants, jihadists, including foreign terrorists, have gathered in Idlib. This [patrolling missions] is a very delicate and serious process and, naturally, we cannot afford putting at risk Russian servicemen who would be fulfilling this task,” he said. Kurdish rebels targeted Trukish-backed militants with an ATGM in Afrin. 1 person was killed, 2 were injured. Whoever wins, its the bad guys :( and the more of them killing each other, the better chance there is for peace among the rest. And outside my window its cold, cloudy, rainy and if somebosy has moved the sun to Spain. If the Nobel peaceprice was converted to War for any price, several in Syria and around of it had to share. Thats for sure. No wonder so many in the world use drugs. Forget the Turks, if they do not play by the rules, or continue to protect the terrorists, eliminate them all. Yep! So Russia should “accidentally ” torch Turk soldiers every so often till Turkey gets the message and gets rid of the headchoppers and itself back to Erdoganistan. This Idlib trash never worked and was supposedly to forestall NATO attacks for false flag chemical bombs. NATO did not attack so now just bomb them to Kingdom Come! Never go in ,just bomb and starve them out. Did I not just say that ?. What this says to me is that the Turks have been granted an extension on the December 31, 2018 expiration of the Idlib DMZ agreement. Where they have gotten not only an extension, but also what looks like increased authorization to begin unilateral DMZ patrols between their observation posts, in exchange for promises of joint patrols with Russian forces in terrorist occupied areas as stipulated in the DMZ agreement. So it looks like the Turks gained concessions as a reward for their non compliance and implementation failures. If they don’t make good on their commitments this time. Then there should be a resumption of clearing operations to move the front lines forward and recover area to restore Syrian government administration there. There’s a saying here in the US that fool me once, shame on you, fool me twice, then shame on me. The Russians are being set up to be made the fool. If that happens. There needs to be corrective action taken on their part. It would be great if the Turks can deliver on their end of the deal. They’re obviously traveling freely throughout the terrorist occupied areas. If they can’t conduct joint patrols with the Russians in these areas. Then it means that they’re unwilling to enforce the agreement on adversarial terrorists. And that their promises to implement the agreement are fake. The Russians aren’t playing the fool, they’re winning the war and Israel, the US and the rest of their war criminal partners are losing it. If the Turks do make fools out of the Russians, then that needs to be addressed. Bombing the Turk’s proxy Idlib terrorists on a regular basis isn’t a peaceful solution. And if the Turks keep stalling, it needs to be added to with clearing operations in the DMZ. The question my dear is if the Syrian people are wining. Turks invaded Syrian with the permission of Russians and Turks never leave an occupied land. Remind you what happened in Cyprus. Turkey has been involved in the Syrian war from the beginning with both it’s proxies and it’s own forces. Russia didn’t give them permission to do this and has been attacking the Turk proxies for years. They entered into an agreement with the Turks pertaining to the forces that Turkey already had in Idlib to restructure the Turkish presence there to get them to clean up the mess with their proxies. Seems that RU has been successful, albeit in many small steps, at getting the Turks on-side. This will ultimately be decisive in getting east Syria clear w/o WW3 as US presence there becomes more marginal, once the pdf proxy falls. Turks will try to retain border regions of course. All of Syria’s neighbors with the exception of Lebanon are supporting the partition and foreign occupation of Syria under various Jew contrived Hegelian pretexts. The Iraq border should be closed to US supplies to the Kurds. Instead there’s a free flow of personnel and materials going across it supporting the US occupation. The same goes for Jordan. The Turks are obviously supporting and protecting the terrorists in Idlib. All of Syria not under foreign occupation has been cleared of the proxy terrorists that Syria’s neighbors have been supporting. None of them are going to stop supporting the occupation and partition of Syria until they’re brought to task for it. These border crossings being used to support the partition and occupation need to be brought under Syrian control to interdict these personnel and materials transfers going across them. Turks are laughing all the way to the bank with their defacto annexation of Idlib to Turkey. Speynaz needs to go in and shoot Turk officers in the head and send a message. Russia acting as it has is wrong unless it is happy to hand over Syrian land to Turkey.The sad thing is I suspect it is! The Syria war is very costly for the Turks. The Saudis aren’t subsidizing Turkey. The Russians stopped the oil theft and the Turks lost quite a few people clearing the Kurd terrorists out of Afrin. They also are under a lot of economic pressure from the Jew controlled US. Shooting Turks isn’t going to solve the problem, clearing their proxy terrorists if the Turks continue stalling on the DMZ agreement implementation will solve it. It needs to be plan B or A depending on what the Turks do with this grace period that they’ve just been granted. You are right but Russia must act symbolically every so often to maintain credibility. Symbolic attacks speak volumes and this Russian /Turkish dancing is very tiring. Russia is hitting the Turk proxies, which is all of the terrorists in Idlib, with airstrikes on a regular basis. And is pressuring the Turks to get the terrorist problem there of the Turk’s own making cleared up. There’s only one place that the terrorists is Idlib are getting there support from, regardless of their proclaimed affiliations, and that’s across the Turkish border with the Turk’s approval. If the Turks don’t cooperate then resuming clearing operations to push the terrorists up against the Turk’s border is an option. Well then that is not equity is it. If Russians are not allowed in then Turcoheadchoppers are not really in a ceasefire are they . They are still invaders. In short, Russia does not trust Turkey, and obviosly they have all reason to do so. Join Russia-Trukish patrols…, hummm Again, Puting trying to please Erdogan. Terrorists are in Idlib and Syria have to get rid of them with or without Russia willing. Alot of pro-syria and Iranians comment in here as if Russia has any dog-fight in Syria. That fact that they fought and saved SAA, Iran and Hezbollah in the region dosen’t mean Russia will be push to WW3 with Nato or war with Turkey due to these silly SAA and Iran supporters. Russia and Turkey has to many economical ties and they benefit from each other more than they do with Syria. 2. Some people in this comment section have pushed the narrative of this war so much that they made Russian gov’t as the true syrian gov’t meaning that SAA, Hezbollah and Iran seem to disappear in their memories where Russia is the only entity there in syria. The truth is Russia is from 2000-5000 Miles north of Syria and that is a long distance. Hence Russia has no dog-fight whatsoever while the gain from that region is ZERO nor beneficial economy or anything close to it. The Oil region is held by the Americans who have forced to exit despite extreme Turkish pressure. I don’t see them exit if that didn’t make them exit. Russia has more gains in Turkey’s economical ties as they buy Gas and Oil from them. 3. Russia has it’s own issues in Ukraine where some of her people are in circled by Poroshenko and his army. Russia has dog-fight and issues on her own doorsteps but Syria nor Idlib is her dog-fight. It’s time for Russia to fix her own issues in the Ukrainian borders and leave behind other peoples issues and fight her own fight. Your map is faulty, Russia is 1500 miles north of Syria, not 5000. 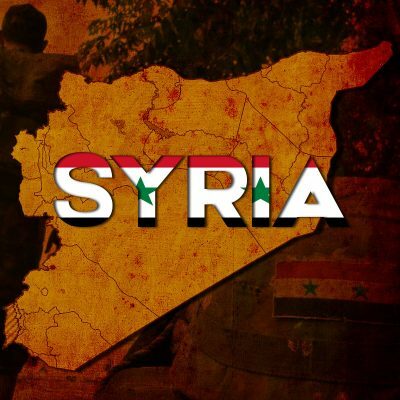 There is no doubt that Iranian militias and Hezbollah have been the boots on the ground that have massively helped SAA reclaim 60 % of Syria’s land. However Russia’s air power and presence has certainly diminished US, Turkish and Israeli air attacks. You may not know but Russia and Syria have been Allies for over 30 years, so they do have a ‘dog-fight’ with these American backed “moderate rebels”. Americans will exit as the Christians and Arabic tribes have grown unhappy with the US backed Kurds, and will press them out. The Iranian militias and Hezbollah plus SAA won’t last 1-2 years past Russian exit which goes to show you that there influence is overstated. They technically didn’t win this war by any means necessary. What defeated the insurgency in Syria was The Americans and the Russians constant bombardment to the point of levelling cities like Raqqa, Aleppo, Homs, Hama, Mosul, Eastern Ghouta etc etc. Without The Americans and Russians entering the Syrian war the outcome would have been extremely different on the ground. Rebels were extremely superior compared to the Iranian militias, Hezbollah and SAA. They had to contend with Superpowers coming hard down on them and cities getting levelled to the ground. It was a conventional war against Non-state actors. The playing field was never fair nor was the Syrian war a civil war. “SAA won’t last 1-2 years past Russian exit”, you seem to think they are leaving, you missed the part of Syria and Russia being Allies. “Nor was the Syrian war a civil war” , well your right on that. “The insurgency” were paid insurgents, and were funded by Qatar, Turkey and Saudi Arabia with the US facilitating the ‘regime change’. According to the Qatari PM, they spent 132 billion dollars training, arming and paying these “superior rebels”. Were you one of them. I agree in the pushing and pushing. Hard ly none here are for how to make peace, which normally is much more difficult. None of those have any programs for any future apart from all think, they will win the war. Winning peace is no option. So yes it is in the animal level incl. dogs fighting. “Complicated Process ” ? I would say stupid process by Russia if accept to do this.